This horror classic is well deserving of its status as one of the best horror films ever made. An architect is invited to a country farmhouse along with a number of other guests but he can't shake the unsettling feeling that he has been there before. They take turns telling stories as a kind of challenge to the unremittingly logical and dour psychiatrist present. 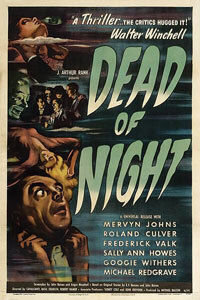 Spooky, chilling and ultimately terrifying this is beautifully made by some of Ealing Studios' finest talent. It has certainly aged over the years but there are a number of classic horror stories here that have influenced the genre profoundly.